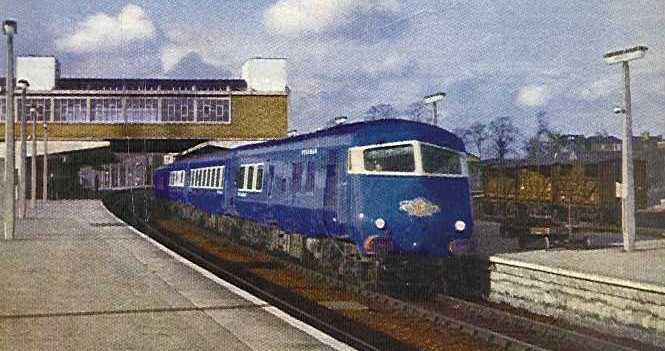 Designed and built by Metro-Cammell of Birmingham, these luxury trains were introduced to the London Midland and Western regions of BR in 1960 whilst the West Coast Main Line was being electrified. 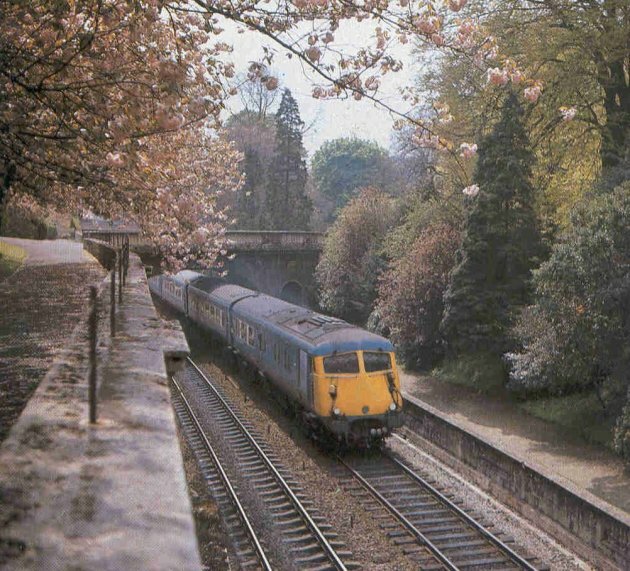 Two 6-car sets ran primarily between Manchester Central and St Pancras on the Midland's main line through the Peak District and the daily train only called at Leicester, avoiding Derby by running via Chaddesden Sidings. 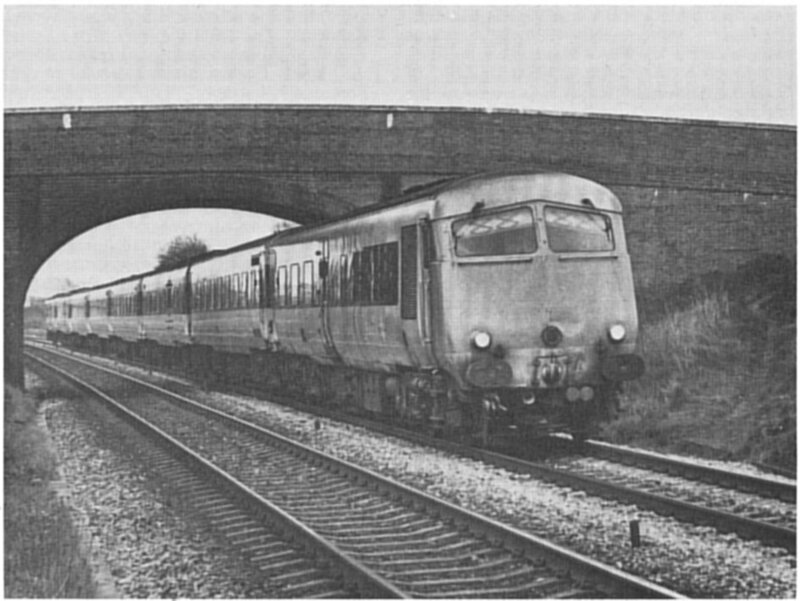 The other three 8-car sets ran between London, Bristol and Birmingham. Initially shown to the general public on June 23rd, 1960 at Marylebone Station these 90 mile/h trains were a revelation on the railways of the day. There were five trains, the two six car sets having first class only, which ran the Midland services, and the three eight car sets, which ran between Paddington and Bristol and also between Paddington and Wolverhampton via Birmingham, which had first and second class accommodation. 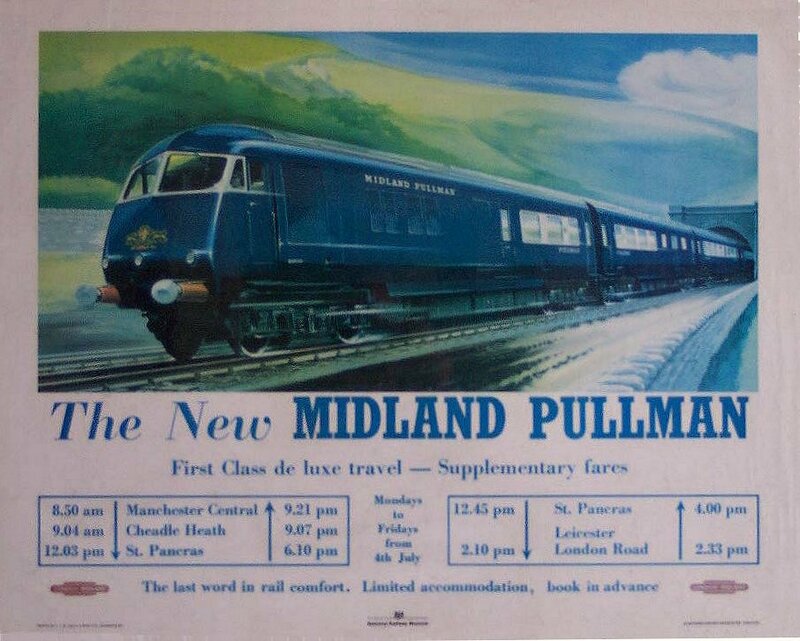 The Midland Pullman entered service between London St Pancras and Manchester on 4th July 1960 and ceased at the start of electric-hauled trains between Euston and Manchester. The Midland Pullman arrives at St Pancras on its first day in service - 4th July 1960. The Midland Pullman leaves St Pancras en route for Leicester on its mid-day trip on September 15th 1960. Note the oil tail lamp! The striking livery of Nanking Blue was relieved by a broad band of white extending the length and width of the windowed section along the side of each car. The roofs were light grey and the cars had aluminium-coloured underframes and black bogies. The Pullman Company crest was carried on the nose end of the power cars. They were fully air-conditioned and insulated against noise, with double glazed windows having Venetian blinds within the panes. The trains were air braked but were not fitted with AWS at first. To read a contemporary article describing the journey between Manchester and London click here. The Down Midland Pullman passes Kettering on mid-day trip to Leicester sometime in the summer of 1960. The contrast between this modern train and the infrastructure of the railway is emphasised by the gas lamp and Midland lower quadrant signal. 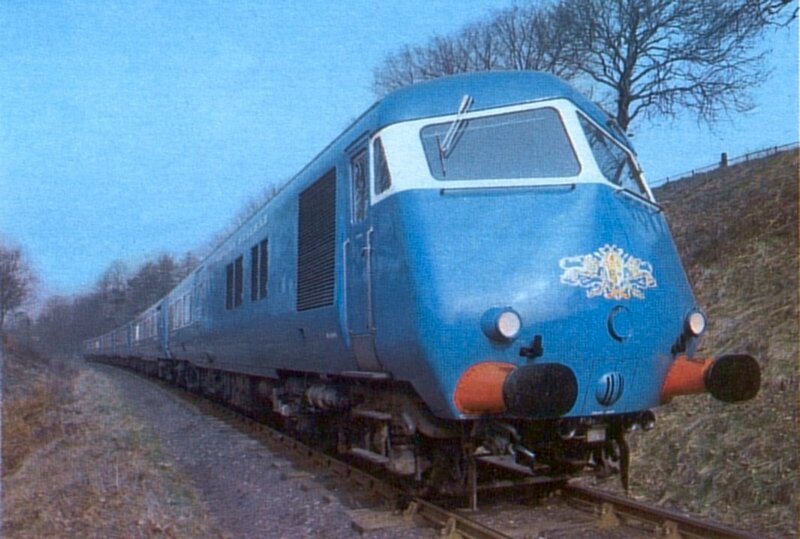 The power cars were fitted with 1000 HP MAN engines supplied by the North British Locomotive Company. 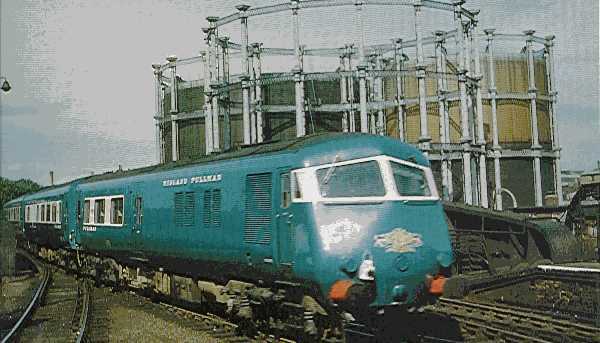 The GEC main generators supplied DC power for traction purposes and the auxiliary generator supplied battery chargers control circuits, compressors and cab heaters. Perhaps surprisingly the AC power for lighting, air conditioning etc was supplied by two separate Rolls Royce 8 cylinder horizontally mounted diesel engines. Leaving Manchester at 08.50 the train took 3¼ hours to reach London. After a half-hour layover it departed for Leicester at 12.45 returning at 16.00. The final trip back to Manchester left London at 18.10. In 1961 the mid-day trip was extended to Nottingham. Unfortunately the Metro-Schlieren bogies were renowned for bad riding and these problems beset the trains throughout their short lives. 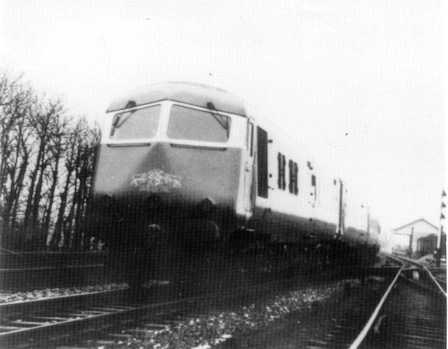 In 1961 some test runs were carried out from Derby which terminated at Old Dalby. One of the 6-car Midland Pullman sets pictured at Old Dalby, on the Up main line just south of the station. It would appear to be about to return to Derby via Nottingham and Trent Jcn. The goods shed in the right background still stands today and is used by the local coal man. The sidings to the right are those which served the MOD Depots. 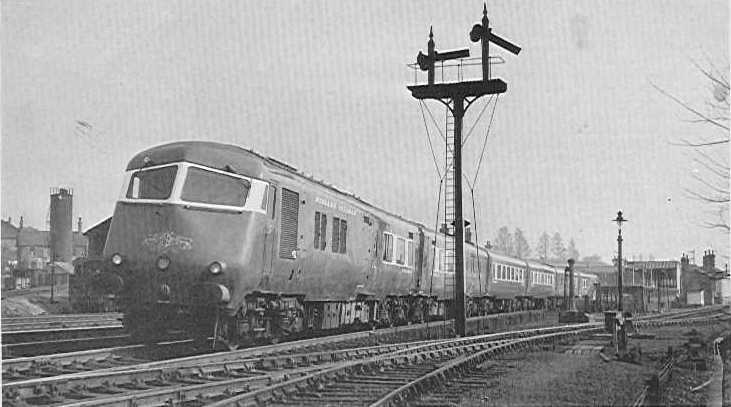 After its initial success the Midland Pullman suffered a loss of custom after the West Coast services were accelerated with the introduction of through electric trains from Euston to Manchester Piccadilly and after 1967 the six car sets joined their stable mates on the Western Region. Some re-jigging of the sets and multiple working modifications meant that 12 car formations were run by the WR, and a special booklet was produced for the staff. However they were still dogged with bad riding, some travellers actually avoiding them and eventually they were withdrawn altogether in 1973 and none survived the cutter's torch. 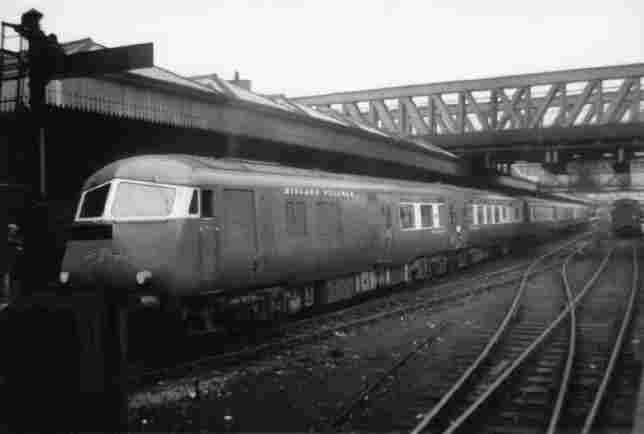 For a lot more information about the Midland Pullman have a look here.